In the world of parkour, there are a number of different names for different movements. With an activity as young as parkour, and as widespread and disjointed, there are bound to be discrepancies between groups and what they call their movements. One of the most observed occurrences of this difference in terminology are the terms kong and catpass. In this case, there is a distinct catalyst as to why the discrepancy came to be, and remains an issue today. This is how the monkey got its name. In 2002, London saw it’s first glimpse of parkour via the BBC Ident, Rush Hour, featuring David Belle. Around the same time, the Yamakasi were featured on Ripley’s Believe It or Not. 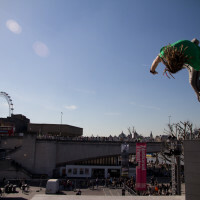 However, parkour didn’t fully come to England until the broadcast of Jump London – a Channel 4 documentary featuring Sebastien Foucan, Jerome Ben Aoues, and Johann Virgoux – in 2003. Paul Corkery, better known as EZ, stumbled onto the parkour scene after his t-shirt business, ChokeAthletics, was unsuccessful. According to www.parkourpedia.com, only two days after his first experience with parkour, EZ registered the website Urban Freeflow. EZ also had the assistance of his business partner, Mark Toorock (M2), who would later go on to create American Parkour. 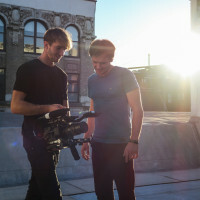 With parkour being relatively unheard of in the United Kingdom, Urban Freeflow was set up to be the ultimate source for parkour information in the UK. At this time, there was no Google translate, YouTube did not exist, and all anyone knew of parkour was what they saw on television. Because of this barrier, all anyone could do was glean as much information as they could by watching the movements of the original French traceurs and experiment. This led to a natural need to have names for the movements that the first generation of UK traceurs were discovering. No one had any idea that names such as “saut de chat” and “saut de bras” existed. One of the oldest parkour groups in the UK are the Saiyans. At one point they were closely affiliated with Urban Freeflow and they came up with the term “monkey vault” to describe the French’s saut de chat. As naming things became a habit, and as skill levels progressed, Urban Freeflow began creating tutorials, one of which featured a move called a “Kong.” In their minds, larger monkey vaults were completely separate movements and were called “King Kong” vaults, after the largest monkey out there. The term King Kong was eventually shortened to “kong” and the Saiyans eventually left Urban Freeflow. Only the oldest school practitioners remember when the Imax spot in London was orange. 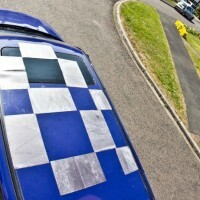 Yes, thats ‘Blue’ from Storm Freerun in this photo, still absolutely killing it after 10+ years. As Urban Freeflow grew in popularity, the greater community of traceurs had no one else to look to for information, making EZ’s company the de facto resource for parkour information. This information was generally created by Urban Freeflow and only vaguely attempted to personify the French idea of parkour. In 2005, M2 created American Parkour (APK) after he and EZ developed unresolved friction around the time that Urban Freeflow had failed to comply with tax law. APK used the same terms and names as Urban Freeflow did, effectively bringing the monkey and kong vaults to the United States. Uneasy about Urban Freeflow’s reputation and distrbution of knowledge, a handful of traceurs from Cambridge, including members of the old Cambridge Traceurs team, decided to take one of the first parkour pilgrimages to Lisses in 2005—the so-called birthplace of parkour. In their party were Jason Matten, Jin Donovan, Liv Rowlands, Chris ‘Blane’ Rowat, Owen Covill, and some of the Saiyans. Upon arriving in Lisses and meeting up with the original French traceurs, they learned that what they were calling monkey and kong vaults, were in fact called “saut de chat,” translated literally to “jump of the cat” in English. When the group returned, they wanted to use the proper term as was used by the founders. “Saut de chat” doesn’t exactly mesh with the English language, so the group sought to shorten it in keeping the roots intact. In French, the word for “vault” is “passement,” in combining that with saut de chat, “catpass” was born. The group began using this term and spreading it around. Similarly, the term “catleap” was being used to represent the French term, “saut de bras,” meaning “jump of the arm.” This was changed to “armjump” to more closely attribute it to its French roots. Urban Freeflow’s initial naivety with parkour’s origin has created a discrepancy that now spans the world. In the United States, the overarching majority of traceurs use the term “kong;” in Australia traceurs use the term “catpass,” partially because several Australians visited Cambridge in 2006 and took it back with them. In Europe, “catpass” is now widely used in its native translation. “Katze” for German, “Gato” for Spanish. The ‘Monkey’ and ‘Kong’ movements are, and have always been, the same. Europe now uses the term ‘Catpass’ almost exclusively, and the rest of the world is catching up. Written and published by Chris Kessler in 2013. Article info sourced by Scott Bass. 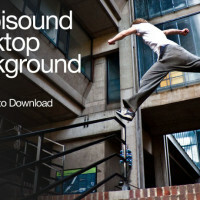 Republished from UniversalParkour to Ampisound to preserve the article. Note: The content of this article is based on memories that are nearly a decade old and any misinterpretation of events is probably due to fuzzy memory. While the specifics may be a year off, or missing a person, the main point and truth of the article stands. Great, article, thank you for writing this. Great to know. I’ve seen you guys saying catpass on facebook and youtube but tought of it being only like an alternative name. Didn’t know why. Here in Brazil i never heard anyone calling it catpass, only monkey and kong are used. I’d like to point out that “The first parkour pilgrimage” in this context would more likely be myself, I was in fact not just trying to make stuff up and ignoring the origins, but traveled to Lisses training with Sebastien Foucan in 2003 and also travelling on to train with Tomas Couedtic at his house in Tours in the same trip. Please stop reading history from people who weren’t there, the reason I left UF was a disagreement with EZ over the term “Freestyle Parkour”. As for the main intention of the article, I was present on the days the monkey and kong got their names 😉 Peace! This article never said you made anything up, or that you ignored any orgins. It just says APK used the UF terms too? Also it says ‘one of the first’ parkour pilgrimages? Did you read it thoroughly dude? Feel like you might have interpreted this wrong. As the Fabricio up here in Brazil never called Catpass, always call or monkey Kong, great text.